Use the Display resolutions report to see which display settings are the most popular for accessing your site. This is useful because the report will allow you to test and optimize usability for your users and visitors per browser display setting. The columns in the table are; Display resolutions, Visitors, Percentage. 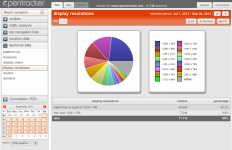 The Display resolutions report displays all visits to your site filtered by Display resolutions. Visually, the report is made up of a list of all Display settings used to visit your site, in order of popularity.